Anyone who is following the Lenten “Cultivating Sacred Space” journey with me probably has realized that labyrinths are an important symbol of my holy ground. The labyrinth offers a sacred space for me. 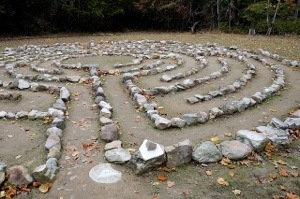 Walking the labyrinth is a deep journey of contemplative prayer that has called to me and offered me stillness and connection with Divine Presence across chapters of my spiritual journey. The labyrinth (and its various forms) are as deeply rooted in Christian faith as they are in ancient, pre-Christian spirituality. The confluence of these traditions is especially significant to me, linking our human desire to connect with Divine Presence as central to our very existence. When I close my eyes and reflect on “Holy Ground” in my life, I see my foot taking a step into the Labyrinth. What is interesting about that image is that I see my foot, that very first step. While I am walking the labyrinth, my thoughts dissipate into the journey. I have moments I recall from specific labyrinth walks, some of which I have talked about before on this blog (Windows of Grace, Walking the Labyrinth, Spiritual and Religious). These are holy times that have held meaning and significance to my journey. I walk labyrinths when I travel, when I retreat, and as a part of my spiritual direction. The path I walk on each labyrinth journey eventually becomes a cadence of prayer and meditation. But, that very first step I take is pure intention turned into action. With that first step, I offer something up. I place the state of my heart, mind, and spirit into the action of my body and I move forward. My footstep becomes a prayer, a holy connection with God. That step is my Holy Ground. If you see me this Lenten season, you will see me wearing a labyrinth pendant. This is my symbol of spiritual connection, reminding me that every step I take in my day is a part of the journey of my faith. Each step follows that same intention with which I begin the labyrinth journey: to seek God in all things, to find Christ in each person. To continue a journey in faith, open to where the path leads and the journey emerges. Each day is Sacred Space. Each step is Holy Ground. This entry was posted in Lent 2014 and tagged Contemplation, faith, journey, labyrinth, Spiritual journey, spirituality. Bookmark the permalink.